For the video game character and its namesake, see Sonic the Hedgehog (character). Sonic hedgehog is a protein that in humans is encoded by the SHH ("sonic hedgehog") gene. Both the gene and the protein may also be found notated alternatively as "Shh". SHH gene is located on the long (q) arm of chromosome 7 at position 36. 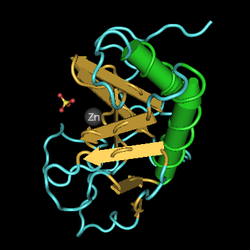 Sonic hedgehog is one of three proteins in the mammalian signaling pathway family called hedgehog, the others being desert hedgehog (DHH) and Indian hedgehog (IHH). SHH is the best studied ligand of the hedgehog signaling pathway. It plays a key role in regulating vertebrate organogenesis, such as in the growth of digits on limbs and organization of the brain. Sonic hedgehog is the best established example of a morphogen as defined by Lewis Wolpert's French flag model—a molecule that diffuses to form a concentration gradient and has different effects on the cells of the developing embryo depending on its concentration. SHH remains important in the adult. It controls cell division of adult stem cells and has been implicated in the development of some cancers. The hedgehog gene (hh) was first identified in the fruit-fly Drosophila melanogaster in the classic Heidelberg screens of Christiane Nüsslein-Volhard and Eric Wieschaus, as published in 1980. These screens, which led to them winning the Nobel Prize in 1995 along with developmental geneticist Edward B. Lewis, identified genes that control the segmentation pattern of the Drosophila embryos. The hh loss of function mutant phenotype causes the embryos to be covered with denticles, small pointy projections resembling the spines of a hedgehog. Investigations aimed at finding a hedgehog equivalent in vertebrates by Philip Ingham, Andrew P. McMahon, and Clifford Tabin, revealed three homologous genes. Two of these, desert hedgehog and Indian hedgehog, were named for species of hedgehogs, while sonic hedgehog was named after Sonic the Hedgehog, the protagonist of the eponymous video game franchise. The name was devised by Robert Riddle, who was a postdoctoral fellow at the Tabin Lab, after he saw a Sonic comic book his daughter owned. In the zebrafish, two of the three vertebrate hh genes are duplicated: SHH a, SHH b (formerly described as tiggywinkle hedgehog, named for Mrs. Tiggy-Winkle, a character from Beatrix Potter's books for children), ihha and ihhb (formerly described as echidna hedgehog, named for the spiny anteater and not for the echidna character Knuckles in the Sonic franchise). Of the hh homologues, SHH has been found to have the most critical roles in development, acting as a morphogen involved in patterning many systems, including the limb and midline structures in the brain, spinal cord, the thalamus by the zona limitans intrathalamica the lungs, and the teeth. Mutations in the human sonic hedgehog gene, SHH, cause holoprosencephaly type 3 HPE3 as a result of the loss of the ventral midline. 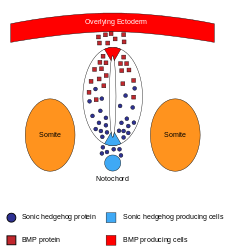 Sonic hedgehog is secreted at the zone of polarizing activity, which is located on the posterior side of a limb bud in an embryo. The sonic hedgehog transcription pathway has also been linked to the formation of specific kinds of cancerous tumors, including the embryonic cerebellar tumor, and medulloblastoma, as well as the progression of prostate cancer tumours. For SHH to be expressed in the developing embryo limbs, a morphogen called fibroblast growth factors must be secreted from the apical ectodermal ridge. Sonic hedgehog has also been shown to act as an axonal guidance cue. It has been demonstrated that SHH attracts commissural axons at the ventral midline of the developing spinal cord. Specifically, SHH attracts retinal ganglion cell (RGC) axons at low concentrations and repels them at higher concentrations. The absence (non-expression) of SHH has been shown to control the growth of nascent hind limbs in cetaceans (whales and dolphins). The sonic hedgehog (SHH) signaling molecule assumes various roles in patterning the central nervous system (CNS) during vertebrate development. One of the most characterized functions of SHH is its role in the induction of the floor plate and diverse ventral cell types within the neural tube. The notochord, a structure derived from the axial mesoderm, produces SHH, which travels extracellularly to the ventral region of the neural tube and instructs those cells to form the floor plate. Another view for floor plate induction hypothesizes that some precursor cells located in the notochord are inserted into the neural plate before its formation, later giving rise to the floor plate. The neural tube itself is the initial groundwork of the vertebrate CNS, and the floor plate is a specialized structure and is located at the ventral midpoint of the neural tube. Evidence supporting the notochord as the signaling center comes from studies in which a second notochord is implanted near a neural tube in vivo, leading to the formation of an ectopic floor plate within the neural tube. Sonic hedgehog is the secreted protein which mediates signaling activities of the notochord and floor plate. Studies involving ectopic expression of SHH in vitro and in vivo result in floor plate induction, and differentiation of motor neuron and ventral interneurons. On the other hand, mice mutant for SHH lack ventral spinal cord characteristics.In vitro blocking of SHH signaling using antibodies against it shows similar phenotypes. SHH exerts its effects in a concentration-dependent manner, so that a high concentration of SHH results in a local inhibition of cellular proliferation. This inhibition causes the floor plate to become thin compared to the lateral regions of the neural tube. Lower concentration of SHH results in cellular proliferation and induction of various ventral neural cell types. 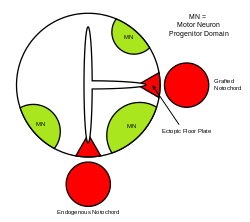 Once the floor plate is established, cells residing in this region will subsequently express SHH themselves generating a concentration gradient within the neural tube. Although there is no direct evidence of a SHH gradient, there is indirect evidence via the visualization of Patched (Ptc) gene expression, which encodes for the ligand binding domain of the SHH receptor throughout the ventral neural tube. In vitro studies show that incremental two- and threefold changes in SHH concentration give rise to motor neuron and different interneuronal subtypes as found in the ventral spinal cord. These incremental changes in vitro correspond to the distance of domains from the signaling tissue (notochord and floor plate) which subsequently differentiates into different neuronal subtypes as it occurs in vitro. Graded SHH signaling is suggested to be mediated through the Gli family of proteins which are vertebrate homologues of the Drosophila zinc-finger-containing transcription factor Cubitus interruptus (Ci) . Ci is a crucial mediator of hedgehog (Hh) signaling in Drosophila. 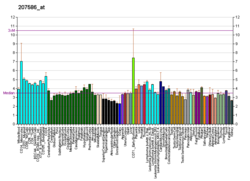 In vertebrates three different Gli proteins are present, viz. Gli1, Gli2 and Gli3, which are expressed in the neural tube. Mice mutant for Gli1 show normal spinal cord development, suggesting that it is dispensable for mediating SHH activity. However Gli2 mutant mice show abnormalities in the ventral spinal cord with severe defects in the floor plate and ventral-most interneurons (V3). Gli3 antagonizes SHH function in a dose dependent manner, promoting dorsal neuronal subtypes. SHH mutant phenotype can be rescued in SHH/Gli3 double mutant. Gli proteins have a C-terminal activation domain and an N-terminal repressive domain. SHH is suggested to promote the activation function of Gli2 and inhibit repressive activity of Gli3. SHH also seems to promote the activation function of Gli3 but this activity is not strong enough. The graded concentration of SHH gives rise to graded activity of Gli 2 and Gli3, which promote ventral and dorsal neuronal subtypes in the ventral spinal cord. Evidence from Gli3 and SHH/Gli3 mutants show that SHH primarily regulates the spatial restriction of progenitor domains rather than being inductive, as SHH/Gli3 mutants show intermixing of cell types. SHH also induces other proteins with which it interacts, and these interactions can influence the sensitivity of a cell towards SHH. Hedgehog-interacting protein (HHIP) is induced by SHH which in turn attenuates its signaling activity. Vitronectin is another protein that is induced by SHH; it acts as an obligate co-factor for SHH signaling in the neural tube. 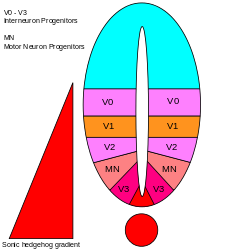 There are five distinct progenitor domains in the ventral neural tube, viz. V3 interneuron, motor neurons (MN), V2, V1, and V0 interneurons (in ventral to dorsal order). These different progenitor domains are established by "communication" between different classes of homeobox transcription factors. (See Trigeminal nerve.) These transcription factors respond to SHH gradient concentration. Depending upon the nature of their interaction with SHH, they are classified into two groups, class I and class II, and are composed of members from the Pax, Nkx, Dbx, and Irx families. Class I proteins are repressed at different thresholds of SHH, delineating ventral boundaries of progenitor domains; while class II proteins are activated at different thresholds of SHH, delineating the dorsal limit of domains. Selective cross-repressive interactions between class I and class II proteins give rise to five cardinal ventral neuronal subtypes. It is important to note that SHH is not the only signaling molecule exerting an effect on the developing neural tube. Many other molecules, pathways, and mechanisms are active (e.g. RA, FGF, BMP), and complex interactions between SHH and other molecules are possible. BMPs are suggested to play a critical role in determining the sensitivity of neural cell to SHH signaling. Evidence supporting this comes from studies using BMP inhibitors which ventralize the fate of the neural plate cell for a given SHH concentration. On the other hand, mutation in BMP antagonists (such as noggin) produces severe defects in ventral-most characteristics of the spinal cord followed by ectopic expression of BMP in the ventral neural tube. Interactions of SHH with Fgf and RA have yet not been studied in molecular detail. The concentration and time-dependent, cell-fate-determining activity of SHH in the ventral neural tube makes it a prime example of a morphogen. In vertebrates, SHH signaling in the ventral portion of the neural tube is most notably responsible for the induction of floor plate cells and motor neurons. SHH emanates from the notochord and ventral floor plate of the developing neural tube to create a concentration gradient that spans the dorso-ventral axis. Higher concentrations of the SHH ligand are found in the most ventral aspects of the neural tube and notochord, while lower concentrations are found in the more dorsal regions of the neural tube. The SHH concentration gradient has been visualized in the neural tube of mice engineered to express a SHH::GFP fusion protein to show this graded distribution of SHH during the time of ventral neural tube patterning. It is thought that the SHH gradient works to elicit multiple different cell fates by a concentration and time-dependent mechanism that induces a variety of transcription factors in the ventral progenitor cells. Each of the ventral progenitor domains expresses a highly individualized combination of transcription factors—Nkx2.2, Olig2, Nkx6.1, Nkx 6.2, Dbx1, Dbx2, Irx3, Pax6, and Pax7—that is regulated by the SHH gradient. These transcription factors are induced sequentially along the SHH concentration gradient with respect to the amount and time of exposure to SHH ligand. As each population of progenitor cells responds to the different levels of SHH protein, they begin to express a unique combination of transcription factors that leads to neuronal cell fate differentiation. This SHH-induced differential gene expression creates sharp boundaries between the discrete domains of transcription factor expression, which ultimately patterns the ventral neural tube. The spatial and temporal aspect of the progressive induction of genes and cell fates in the ventral neural tube is illustrated by the expression domains of two of the most well characterized transcription factors, Olig2 and Nkx2.2. Early in development the cells at the ventral midline have only been exposed to a low concentration of SHH for a relatively short time, and express the transcription factor Olig2. The expression of Olig2 rapidly expands in a dorsal direction concomitantly with the continuous dorsal extension of the SHH gradient over time. 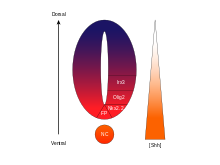 However, as the morphogenetic front of SHH ligand moves and begins to grow more concentrated, cells that are exposed to higher levels of the ligand respond by switching off Olig2 and turning on Nkx2.2., creating a sharp boundary between the cells expressing the transcription factor Nkx2.2 ventral to the cells expressing Olig2. It is in this way that each of the domains of the six progenitor cell populations are thought to be successively patterned throughout the neural tube by the SHH concentration gradient. Mutual inhibition between pairs of transcription factors expressed in neighboring domains contributes to the development of sharp boundaries, however, in some cases, inhibitory relationship has been found even between pairs of transcription factors from more distant domains. Particularly, NKX2-2 expressed in the V3 domain is reported to inhibit IRX3 expressed in V2 and more dorsal domains, although V3 and V2 are separated by a further domain termed MN. Sonic hedgehog (SHH) is a signaling molecule that is encoded by the same gene sonic hedgehog. SHH plays very important role in organogenesis and most importantly craniofacial development. Being that SHH is a signaling molecule it primarily works by diffusion along a concentration gradient affecting cells in different manners. In early tooth development, SHH is released from the primary enamel knot, a signaling center, to provide positional information in both a lateral and planar signaling pattern in tooth development and regulation of tooth cusp growth. SHH in particular is needed for growth of epithelial cervical loops, where the outer and inner epitheliums join and form a reservoir for dental stem cells. After the primary enamel knots are apoptosed, the secondary enamel knots are formed. The secondary enamel knots secrete SHH in combination with other signaling molecules to thicken the oral ectoderm and begin patterning the complex shapes of the crown of a tooth during differentiation and mineralization. In a knockout gene model, absence of SHH is indicative of holoprosencephaly. However SHH activates downstream molecules of Gli2 & Gli3. Mutant Gli2 and Gli3 embryos have abnormal development of incisors that are arrested at early in tooth development as well as small molars. Although SHH is most commonly associated with brain and limb digit development, it is also important in lung development. Studies using qPCR and knockouts have demonstrated that SHH contributes to embryonic lung development. The mammalian lung branching occurs in the epithelium of the developing bronchi and lungs. SHH expressed throughout the foregut endoderm (innermost of three germ layers) in the distal epithelium where the embryonic lungs are developing. This suggests that SHH is partially responsible for the branching of the lungs. Further evidence of SHH’s role in lung branching has been seen with qPCR. SHH expression occurs in the developing lungs around embryonic day 11 and is strongly expressed in the buds of the fetal lungs but low in the developing bronchi. Mice who are deficient in SHH can develop tracheoesophageal fistula (abnormal connection of the esophagus and trachea). Additionally, it a double (SHH-/- ) knockout mouse model exhibited poor lung development. The lungs of the SHH double knockout failed to undergo lobation and branching (the abnormal lungs only developed one branch compared to an extensively branched phenotype of the wildtype). Sonic hedgehog may play a role in mammalian hair cell regeneration. By modulating retinoblastoma protein activity in rat cochlea, sonic hedgehog allows mature hair cells that normally cannot return to a proliferative state to divide and differentiate. Retinoblastoma proteins suppress cell growth by preventing cells from returning to the cell cycle, thereby preventing proliferation. Inhibiting the activity of Rb seems to allow cells to divide. Therefore, sonic hedgehog, identified as an important regulator of Rb, may also prove to be an important feature in regrowing hair cells after damage. SHH undergoes a series of processing steps before it is secreted from the cell. Newly synthesised SHH weighs 45 kDa and is referred to as the preproprotein. As a secreted protein it contains a short signal sequence at its N-terminus, which is recognised by the signal recognition particle during the translocation into the endoplasmic reticulum (ER), the first step in protein secretion. Once translocation is complete, the signal sequence is removed by signal peptidase in the ER. There SHH undergoes autoprocessing to generate a 20 kDa N-terminal signaling domain (SHH-N) and a 25 kDa C-terminal domain with no known signaling role. The cleavage is catalysed by a protease within the C-terminal domain. During the reaction, a cholesterol molecule is added to the C-terminus of SHH-N. Thus the C-terminal domain acts as an intein and a cholesterol transferase. Another hydrophobic moiety, a palmitate, is added to the alpha-amine of N-terminal cysteine of SHH-N. This modification is required for efficient signaling, resulting in a 30-fold increase in potency over the non-palmitylated form, and is carried out by a member of the membrane-bound O-acyltransferase family, Protein-cysteine N-palmitoyltransferase, HHAT. A potential inhibitor of the Hedgehog signaling pathway has been found and dubbed "Robotnikinin", in honour of Sonic the Hedgehog's nemesis, Dr. Ivo "Eggman" Robotnik. SHH gradient and Gli activity in the vertebrate neural tube. Zbtb7, an oncogene which was originally named "Pokémon"
^ Echelard Y, Epstein DJ, St-Jacques B, Shen L, Mohler J, McMahon JA, McMahon AP (December 1993). "Sonic hedgehog, a member of a family of putative signaling molecules, is implicated in the regulation of CNS polarity". Cell. 75 (7): 1417–30. doi:10.1016/0092-8674(93)90627-3. PMID 7916661. ^ a b Riddle RD, Johnson RL, Laufer E, Tabin C (1993). "Sonic hedgehog mediates the polarizing activity of the ZPA". Cell. 75 (7): 1401–16. doi:10.1016/0092-8674(93)90626-2. PMID 8269518. ^ Angier N (1994-01-11). "Biologists Find Key Genes That Shape Patterning of Embryos". Science. New York Times. ^ Anwood R (2007-09-06). Emus Can't Walk Backwards. Ebury Press. pp. 113–114. ISBN 978-0-09-192151-4. ^ Tom Simonite (2005-12-15). "Pokémon blocks gene name". 438 (897). Nature. doi:10.1038/438897a. Retrieved 2013-05-23. ^ a b "A Gene Named Sonic". The New York Times. 1994-01-11. ^ Annalise Keen & Cliff Tabin (April 12, 2004). "Cliff Tabin: Super Sonic An Interview". The Weekly Murmur. ^ "Zebrafish SHHa". University of Oregon. ^ "Zebrafish SHHb". University of Oregon. ^ Currie PD, Ingham PW (August 1996). "Induction of a specific muscle cell type by a hedgehog-like protein in zebrafish". Nature. 382 (6590): 452–5. doi:10.1038/382452a0. PMID 8684485. ^ Herzog W, Zeng X, Lele Z, Sonntag C, Ting JW, Chang CY, Hammerschmidt M (February 2003). "Adenohypophysis formation in the zebrafish and its dependence on sonic hedgehog". Dev. Biol. 254 (1): 36–49. doi:10.1016/S0012-1606(02)00124-0. PMID 12606280. ^ Rash BG, Grove EA (Oct 2007). "Patterning the dorsal telencephalon: a role for sonic hedgehog?". The Journal of Neuroscience. 27 (43): 11595–603. doi:10.1523/JNEUROSCI.3204-07.2007. PMID 17959802. ^ Lewis KE, Eisen JS (September 2001). "Hedgehog signaling is required for primary motoneuron induction in zebrafish". Development. 128 (18): 3485–95. PMID 11566854. ^ Scholpp S, Wolf O, Brand M, Lumsden A (March 2006). "Hedgehog signalling from the zona limitans intrathalamica orchestrates patterning of the zebrafish diencephalon". Development. 133 (5): 855–64. doi:10.1242/dev.02248. PMID 16452095. ^ Rash BG, Grove EA (Nov 2011). "Shh and Gli3 regulate formation of the telencephalic-diencephalic junction and suppress an isthmus-like signaling source in the forebrain". Developmental Biology. 359 (2): 242–50. doi:10.1016/j.ydbio.2011.08.026. PMC 3213684. PMID 21925158. ^ Wolpert, Lewis (2015). Principles of Development (5th ed.). Oxford University Press. p. 500. ^ Dassule HR, Lewis P, Bei M, Maas R, McMahon AP (November 2000). "Sonic hedgehog regulates growth and morphogenesis of the tooth" (PDF). Development. 127 (22): 4775–85. PMID 11044393. ^ Taylor MD, Northcott PA, Korshunov A, Remke M, Cho YJ, Clifford SC, Eberhart CG, Parsons DW, Rutkowski S, Gajjar A, Ellison DW, Lichter P, Gilbertson RJ, Pomeroy SL, Kool M, Pfister SM (April 2012). "Molecular subgroups of medulloblastoma: the current consensus". Acta Neuropathologica. 123 (4): 465–72. doi:10.1007/s00401-011-0922-z. PMC 3306779. PMID 22134537. ^ DeSouza RM, Jones BR, Lowis SP, Kurian KM (22 July 2014). "Pediatric medulloblastoma - update on molecular classification driving targeted therapies". Frontiers in Oncology. 4: 176. doi:10.3389/fonc.2014.00176. PMC 4105823. PMID 25101241. ^ Lubik AA, Nouri M, Truong S, Ghaffari M, Adomat HH, Corey E, Cox ME, Li N, Guns ES, Yenki P, Pham S, Buttyan R (2016). "Paracrine Sonic Hedgehog Signaling Contributes Significantly to Acquired Steroidogenesis in the Prostate Tumor Microenvironment". International Journal of Cancer. 140 (2): 358–369. doi:10.1002/ijc.30450. PMID 27672740. ^ Tabin C, Riddle R (February 1999). "How Limbs Develop". Scientific American: 78. ^ Charron F, Stein E, Jeong J, McMahon AP, Tessier-Lavigne M (2003). "The morphogen sonic hedgehog is an axonal chemoattractant that collaborates with netrin-1 in midline axon guidance". Cell. 113 (1): 11–23. doi:10.1016/S0092-8674(03)00199-5. PMID 12679031. ^ Kolpak A, Zhang J, Bao ZZ (March 2005). "Sonic hedgehog has a dual effect on the growth of retinal ganglion axons depending on its concentration". J. Neurosci. 25 (13): 3432–41. doi:10.1523/JNEUROSCI.4938-04.2005. PMC 1564194. PMID 15800198. ^ Thewissen J, Cohn MJ, Stevens LS, Bajpai S, Heyning J, Horton WE (May 2006). "Developmental basis for hind-limb loss in dolphins and origin of the cetacean bodyplan". Proc. Natl. Acad. Sci. U.S.A. 103 (22): 8414–8. doi:10.1073/pnas.0602920103. PMC 1482506. PMID 16717186. ^ Litingtung Y, Chiang C (October 2000). "Control of SHH activity and signaling in the neural tube". Developmental Dynamics. 219 (2): 143–54. doi:10.1002/1097-0177(2000)9999:9999<::AID-DVDY1050>3.0.CO;2-Q. PMID 11002335. ^ Placzek M (August 1995). "The role of the notochord and floor plate in inductive interactions". Current Opinion in Genetics & Development. 5 (4): 499–506. doi:10.1016/0959-437X(95)90055-L. PMID 7580143. ^ Teillet MA, Lapointe F, Le Douarin NM (September 1998). "The relationships between notochord and floor plate in vertebrate development revisited". Proceedings of the National Academy of Sciences USA. 95 (20): 11733–8. doi:10.1073/pnas.95.20.11733. PMC 21709. PMID 9751734. ^ van Straaten HW, Hekking JW, Thors F, Wiertz-Hoessels EL, Drukker J (October 1985). "Induction of an additional floor plate in the neural tube". Acta Morphol Neerl Scand. 23 (2): 91–7. PMID 3834777. ^ Patten I & Placzek M (2000). "Cellular and Molecular Life Sciences". Cellular and Molecular Life Sciences. 57 (12): 1695–1708. doi:10.1007/PL00000652. PMID 11130176. ^ Martí E, Bumcrot DA, Takada R, McMahon AP (May 1995). "Requirement of 19K form of Sonic hedgehog for induction of distinct ventral cell types in CNS explants". Nature. 375 (6529): 322–325. doi:10.1038/375322a0. PMID 7753196. ^ a b c Ericson J, Morton S, Kawakami A, Roelink H, Jessell TM (November 1996). "Two critical periods of Sonic Hedgehog signaling required for the specification of motor neuron identity". Cell. 87 (4): 661–73. doi:10.1016/S0092-8674(00)81386-0. PMID 8929535. ^ Chiang C, Litingtung Y, Lee E, Young KE, Corden JL, Westphal H, Beachy PA (October 1996). "Cyclopia and defective axial patterning in mice lacking Sonic hedgehog gene function". Nature. 383 (6599): 407–13. doi:10.1038/383407a0. PMID 8837770. ^ Placzek M, Tessier-Lavigne M, Yamada T, Jessell T, Dodd J (November 1990). "Mesodermal control of neural cell identity: floor plate induction by the notochord". Science. 250 (4983): 985–8. doi:10.1126/science.2237443. PMID 2237443. ^ a b c Wilson L, Maden M (June 2005). "The mechanisms of dorsoventral patterning in the vertebrate neural tube". Dev. Biol. 282 (1): 1–13. doi:10.1016/j.ydbio.2005.02.027. PMID 15936325. ^ Stone DM, Hynes M, Armanini M, Swanson TA, Gu Q, Johnson RL, Scott MP, Pennica D, Goddard A, Phillips H, Noll M, Hooper JE, de Sauvage F, Rosenthal A (November 1996). "The tumour-suppressor gene patched encodes a candidate receptor for Sonic hedgehog". Nature. 384 (6605): 129–34. doi:10.1038/384129a0. PMID 8906787. ^ Marigo V, Tabin CJ (1996). "Regulation of patched by sonic hedgehog in the developing neural tube". Proc. Natl. Acad. Sci. U.S.A. 93 (18): 9346–51. doi:10.1073/pnas.93.18.9346. PMC 38430. PMID 8790332. ^ a b Ericson J, Briscoe J, Rashbass P, van Heyningen V, Jessell TM (1997). "Graded sonic hedgehog signaling and the specification of cell fate in the ventral neural tube". Cold Spring Harb Symp Quant Biol. 62: 451–66. doi:10.1101/SQB.1997.062.01.053. PMID 9598380. ^ Ericson J, Rashbass P, Schedl A, Brenner-Morton S, Kawakami A, van Heyningen V, Jessell TM, Briscoe J (July 1997). "Pax6 controls progenitor cell identity and neuronal fate in response to graded SHH signaling". Cell. 90 (1): 169–80. doi:10.1016/S0092-8674(00)80323-2. PMID 9230312. ^ Lum L, Beachy PA (June 2004). "The Hedgehog response network: sensors, switches, and routers". Science. 304 (5678): 1755–9. CiteSeerX 10.1.1.476.3902. doi:10.1126/science.1098020. PMID 15205520. ^ a b Ruiz i Altaba A (June 1998). "Combinatorial Gli gene function in floor plate and neuronal inductions by Sonic hedgehog". Development. 125 (12): 2203–12. PMID 9584120. ^ Park HL, Bai C, Platt KA, Matise MP, Beeghly A, Hui CC, Nakashima M, Joyner AL (April 2000). "Mouse Gli1 mutants are viable but have defects in SHH signaling in combination with a Gli2 mutation". Development. 127 (8): 1593–605. PMID 10725236. ^ Matise MP, Epstein DJ, Park HL, Platt KA, Joyner AL (August 1998). "Gli2 is required for induction of floor plate and adjacent cells, but not most ventral neurons in the mouse central nervous system". Development. 125 (15): 2759–70. PMID 9655799. ^ a b c Litingtung Y, Chiang C (October 2000). "Specification of ventral neuron types is mediated by an antagonistic interaction between SHH and Gli3". Nat Neurosci. 3 (10): 979–85. doi:10.1038/79916. PMID 11017169. ^ Sasaki H, Nishizaki Y, Hui C, Nakafuku M, Kondoh H (September 1999). "Regulation of Gli2 and Gli3 activities by an amino-terminal repression domain: implication of Gli2 and Gli3 as primary mediators of SHH signaling". Development. 126 (17): 3915–24. PMID 10433919. ^ Persson M, Stamataki D, te Welscher P, Andersson E, Böse J, Rüther U, Ericson J, Briscoe J (November 2002). "Dorsal-ventral patterning of the spinal cord requires Gli3 transcriptional repressor activity". Genes Dev. 16 (22): 2865–78. doi:10.1101/gad.243402. PMC 187477. PMID 12435629. ^ Chuang PT, McMahon AP (February 1999). "Vertebrate Hedgehog signalling modulated by induction of a Hedgehog-binding protein". Nature. 397 (6720): 617–21. doi:10.1038/17611. PMID 10050855. ^ Pons S, Martí E (January 2000). "Sonic hedgehog synergizes with the extracellular matrix protein vitronectin to induce spinal motor neuron differentiation". Development. 127 (2): 333–42. PMID 10603350. ^ Briscoe J, Pierani A, Jessell TM, Ericson J (May 2000). "A homeodomain protein code specifies progenitor cell identity and neuronal fate in the ventral neural tube". Cell. 101 (4): 435–45. doi:10.1016/S0092-8674(00)80853-3. PMID 10830170. ^ Liem KF, Jessell TM, Briscoe J (November 2000). "Regulation of the neural patterning activity of sonic hedgehog by secreted BMP inhibitors expressed by notochord and somites". Development. 127 (22): 4855–66. PMID 11044400. ^ McMahon JA, Takada S, Zimmerman LB, Fan CM, Harland RM, McMahon AP (May 1998). "Noggin-mediated antagonism of BMP signaling is required for growth and patterning of the neural tube and somite". Genes Dev. 12 (10): 1438–52. doi:10.1101/gad.12.10.1438. PMC 316831. PMID 9585504. ^ Roelink H, Porter JA, Chiang C, Tanabe Y, Chang DT, Beachy PA, Jessell TM (May 1995). "Floor Plate and Motor Neuron Induction by Different Concentrations of the Amino-Terminal Cleavage Product of Sonic Hedgehog Autoproteolysis". Cell. 81 (3): 445–455. doi:10.1016/0092-8674(95)90397-6. PMID 7736596. ^ a b c d e f g h i j Ribes V, Briscoe J (August 2009). "Establishing and interpreting Graded Sonic Hedgehog during Vertebrate Neural Tube Patterning: The Role of Negative Feedback". Cold Spring Harb Perspect Biol. 1 (2): a002014. doi:10.1101/cshperspect.a002014. PMC 2742090. PMID 20066087. ^ a b Chamberlain CE, Jeong J, Guo C, Allen BL, McMahon AP (March 2008). "Notochord-derived Shh concentrates in close association with the apically positioned basal body in neural target cells and forms a dynamic gradient during neural patterning". Development. 135 (6): 1097–1106. doi:10.1242/dev.013086. PMID 18272593. ^ Lovrics A, Gao Y, Juhász B, Bock I, Byrne HM, Dinnyés A, Kovács KA (November 2014). "Boolean modelling reveals new regulatory connections between transcription factors orchestrating the development of the ventral spinal cord". PLOS ONE. 9 (11): 11430. doi:10.1371/journal.pone.0111430. PMC 4232242. PMID 25398016. ^ Nanci A (2012). Ten Cate's Oral Histology: Development, Structure, and Function (8th ed.). St. Louis, Mo. : Elsevier. ISBN 978-0-323-07846-7. ^ Thesleff I (2003). "Epithelial-mesenchymal signalling regulating tooth morphogenesis". J. Cell Sci. 116 (Pt 9): 1647–8. doi:10.1242/jcs.00410. PMID 12665545. ^ Hardcastle Z, Mo R, Hui CC, Sharpe PT (1998). "The SHH signalling pathway in tooth development: defects in Gli2 and Gli3 mutants". Development. 125 (15): 2803–11. PMID 9655803. ^ Wolpert, Lewis (2015). Principles of Development (5th ed.). Oxford University Press. p. 500. ISBN 978-0-19-967814-3. ^ Bellusci S, Furuta Y, Rush MG, Henderson R, Winnier G, Hogan BL (1997). "Involvement of Sonic hedgehog (Shh) in mouse embryonic lung growth and morphogenesis" (PDF). Development. 124 (1): 53–63. PMID 9006067. ^ a b c d e Pepicelli CV, Lewis PM, McMahon AP (1998). "Sonic hedgehog regulates branching morphogenesis in the mammalian lung". Current Biology. 8 (19): 1083–6. doi:10.1016/S0960-9822(98)70446-4. PMID 9768363. ^ White AC, Xu J, Yin Y, Smith C, Schmid G, Ornitz DM (2006). "FGF9 and SHH signaling coordinate lung growth and development through regulation of distinct mesenchymal domains". Development. 133 (8): 1507–17. doi:10.1242/dev.02313. PMID 16540513. ^ Miura, T (2008). Modeling lung branching morphogenesis. Current Topics in Developmental Biology. 81. pp. 291–310. doi:10.1016/S0070-2153(07)81010-6. ISBN 9780123742537. PMID 18023732. ^ a b c Kugler MC, Joyner AL, Loomis CA, Munger JS (2015). "Sonic hedgehog signaling in the lung. From development to disease". American Journal of Respiratory Cell and Molecular Biology. 52 (1): 1–13. doi:10.1165/rcmb.2014-0132TR. PMC 4370254. PMID 25068457. ^ Cardoso WV, Lü J (2006). "Regulation of early lung morphogenesis: questions, facts and controversies". Development. 133 (9): 1611–24. doi:10.1242/dev.02310. PMID 16613830. ^ Lu N, Chen Y, Wang Z, Chen G, Lin Q, Chen ZY, Li H (2013). "Sonic hedgehog initiates cochlear hair cell regeneration through downregulation of retinoblastoma protein". Biochem. Biophys. Res. Commun. 430 (2): 700–5. doi:10.1016/j.bbrc.2012.11.088. PMC 3579567. PMID 23211596. ^ Bumcrot DA, Takada R, McMahon AP (1 April 1995). "Proteolytic processing yields two secreted forms of sonic hedgehog". Mol Cell Biol. 15 (4): 2294–2303. doi:10.1128/MCB.15.4.2294. PMC 230457. PMID 7891723. ^ Ingham (2011). "Mechanisms and functions of Hedgehog signalling across the metazoa". Nature Reviews Genetics. 12 (6): 393–406. doi:10.1038/nrg2984. PMID 21502959. ^ Porter JA, Young KE, Beachy PA (1996). "Cholesterol modification of hedgehog signaling proteins in animal development". Science. 274 (5285): 255–259. doi:10.1126/science.274.5285.255. PMID 8824192. ^ Pepinsky RB, Zeng C, Wen D, Rayhorn P, Baker DP, Williams KP, Bixler SA, Ambrose CM, Garber EA, Miatkowski K, Taylor FR, Wang EA, Galdes A (1998). "Identification of a palmitic acid-modified form of human Sonic hedgehog". J Biol Chem. 273 (22): 14037–14045. doi:10.1074/jbc.273.22.14037. PMID 9593755. ^ Stanton BZ, Peng LF, Maloof N, Nakai K, Wang X, Duffner JL, Taveras KM, Hyman JM, Lee SW, Koehler AN, Chen JK, Fox JL, Mandinova A, Schreiber SL (March 2009). "A small molecule that binds Hedgehog and blocks its signaling in human cells". Nat. Chem. Biol. 5 (3): 154–6. doi:10.1038/nchembio.142. PMC 2770933. PMID 19151731. ^ Maclean K (January 2006). "Humour of gene names lost in translation to patients". Nature. 439 (7074): 266. doi:10.1038/439266d. PMID 16421543. ^ Cohen MM (July 2006). "Problems in the naming of genes". Am. J. Med. Genet. A. 140 (13): 1483–4. doi:10.1002/ajmg.a.31264. PMID 16718675. Dorus S, Anderson JR, Vallender EJ, Gilbert SL, Zhang L, Chemnick LG, Ryder OA, Li W, Lahn BT (2006). "Sonic Hedgehog, a key development gene, experienced intensified molecular evolution in primates". Human Molecular Genetics. 15 (13): 2031–7. doi:10.1093/hmg/ddl123. PMID 16687440. Gilbert, Scott F. (2000). Developmental biology (6th ed.). Sunderland, Mass: Sinauer Associates. ISBN 978-0-87893-243-6. Kim J, Kim P, Hui CC (2001). "The VACTERL association: lessons from the Sonic hedgehog pathway". Clinical Genetics. 59 (5): 306–15. doi:10.1034/j.1399-0004.2001.590503.x. PMID 11359461. Morton JP, Lewis BC (2007). "SHH signaling and pancreatic cancer: implications for therapy?". Cell Cycle. 6 (13): 1553–7. doi:10.4161/cc.6.13.4467. PMID 17611415. Mullor JL, Sánchez P, Ruiz i Altaba A (2003). "Pathways and consequences: Hedgehog signaling in human disease". Trends Cell Biol. 12 (12): 562–9. doi:10.1016/S0962-8924(02)02405-4. PMID 12495844. Nanni L, Ming JE, Du Y, Hall RK, Aldred M, Bankier A, Muenke M (2001). "SHH mutation is associated with solitary median maxillary central incisor: a study of 13 patients and review of the literature". American Journal of Medical Genetics. 102 (1): 1–10. doi:10.1002/1096-8628(20010722)102:1<1::AID-AJMG1336>3.0.CO;2-U. PMID 11471164. Williams JA (2006). "Hedgehog and spinal cord injury". Expert Opinion on Therapeutic Targets. 9 (6): 1137–45. doi:10.1517/14728222.9.6.1137. PMID 16300466. Wikimedia Commons has media related to Sonic hedgehog. ‘Sonic Hedgehog’ sounded funny, at first. New York Times, November 12, 2006.